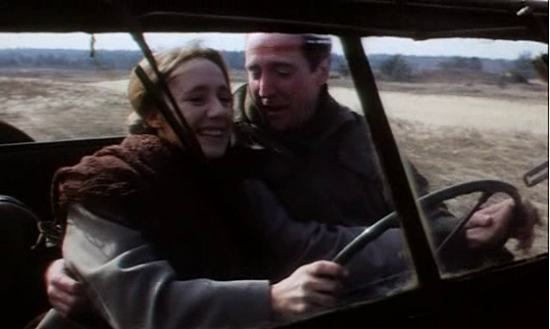 Krzysztof Zanussi's "A Year of the Quiet Sun" (1984) is a wonderful and unforgettable film. Zanussi's name does not come up often on these boards but he is one of the finest Polish and European directors who inspired the whole new generation of Polish filmmakers, including Krzysztof Kieslowski and Agnieszka Holland. There are no gauzy close-ups, no saccharine cascades of music; just a simple exchange of looks between Wilson's Norman, sitting in his military jeep, and Komorowska's Emilia, standing - tense and vulnerable - in the doorway of a seedy hotel. He's an American driver for an Army commission investigating war crimes in a 1946 Polish city; she's a Polish war widow with an elderly, crippled mother. It's Poland in 1946. WWII is over, and Emelia (a radiant Maja Komorowska), and her ailing mother (Hanna Skarzanka), are Polish citizens returning in a crowded boxcar to a town they don't recognize, to lives so shattered rebuilding them seems beyond hopeless. Yet Emilia is philosophical, determined and nonjudgmental. She manages to create a one-room apartment for her and her mother in a bombed-out building. It's dismal, but it is home. Her fortitude is remarkable, and her optimism begins to rub off on her mother, who slowly reverts to her sentimental, jubilant self. Both women have earned a kind of beauty survivors often have; there is light in their eyes. Their shared sense of humor provides healing and serves as a coping mechanism. We may not understand the jokes, but it's a privilege to watch mother and daughter laugh to the point of tears. Occasionally, Emelia goes into the countryside on her bicycle, where she sits in a burned-out car and paints. One afternoon, an American GI stops by the side of the road and proceeds to relieve himself next to the car. He is shame-faced and deeply embarrassed when he learns the car is inhabited, but also in awe of someone who can still find beauty amid such desolation. He is immediately touched by and fascinated with Emelia. 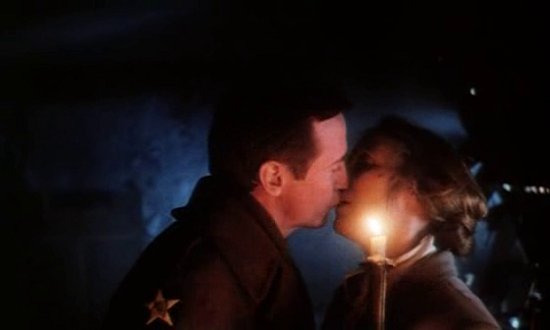 Somewhat unnerved, she leaves quickly, and the soldier makes it his mission to find her again. The GI who is investigating war crimes is Norman (Scott Wilson). When younger soldiers ask why he will stay when he can return home, he tells them he will leave the glory to them. Besides, he has nothing to return to in the States that holds any meaning for him. Norman does find Emelia again, and begins making periodic visits, always bearing gifts. He brings Emelia some paints on his first trip, and later, once he's learned that she is a baker, he brings her a large box of sugar and other goods she needs to make her cakes. Neither speaks the other's language. Each is vulnerable, struggling with the chaos around them. When we see Emilia through Norman's eyes -this haggard, drawn woman with bagged eyes and sudden flashes of defiance - we see what she's quickly become to him: precious, indispensable. And when he pulls away into the night, with the halting discretion and tenderness that are hallmarks of his character, we may feel qualms, sense the reasons this love might not best the hell around it. But it's the gestures more than the gifts that touch Emelia, although she resists his gentle advances. She is scared, and scarred; still grieving for the husband she lost after a marriage of only a few months, and whose body she has never been able to locate to even give a proper burial. 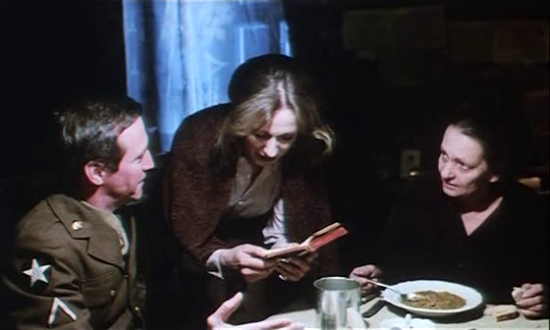 As the troubled couple, barely able to communicate in words, try tentatively to find happiness together in a bleak landscape of doubt, suspicion, and hardship, Zanussi effortlessly avoids all the usual pitfalls, directing with exemplary restraint and an assured sense of period and place. Gradually, the two of them connect, and soon Norman is hopelessly in love. He desperately seeks out translators; they are hopelessly inept. Ultimately, Norman and Emelia come to see that they can see and understand beyond words; that words are superfluous. They plan to marry and leave for America, but Emelia will not leave her mother behind. A subplot suggests there is a way for all of them to leave together which involves something like the "letters of transit" in Casablanca. But things fall apart, despite the mother's sacrifice for her daughter's happiness. Years later, another chance for Emelia to reunite with Norman presents itself, but is thwarted no sooner than it's begun. The film's coda is elegiac. It is homage to the films of John Ford, and to love that transcends language barriers, time and distance. It metaphorically reunites the lovers in Monument Valley and provides the film's final showcase for the work of cinematographer Slawomir Idziak. Emelia and Norman reprise a dance from an earlier scene in the movie which is at once joyless and technically proficient, and in its own way, elegant. As Roger Ebert's puts: "Both directors vowed to film there (Monument Valley) someday. Tarkovsky died before he could. 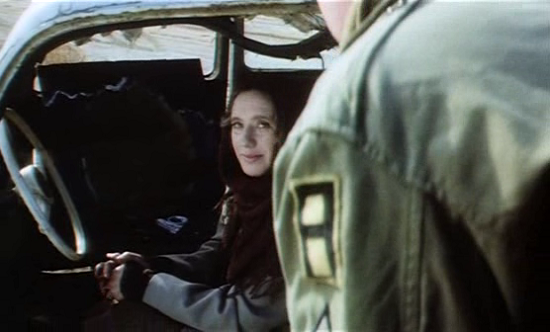 Zanussi traveled to the valley with only his cameraman, his two stars, and Wilson's wife Heavenly as crew, and they filmed the ending, which is poetic in the way it visualizes the hope of the two lovers while reflecting the poignancy of their fates." There is no surprise that this marvelous movie won the 1984 Grand Prize winner at the Venice Film Festival. Zanussi’s thoughtful, carefully detailed story of grief and rehabilitation in post-WWII Eastern Europe wrings humor and poignancy from its characters’ awkwardness around each other. Directed with restraint and an assured sense of place, “A Year of the Quiet Sun” is a wry, humanistic tale of woe that draws to a beautifully surprising close. "A Year of the Quiet Sun" is a great, beautiful and humbling work, a film of majestic compassion. Its conception and execution are thrilling; its actors magnificent. 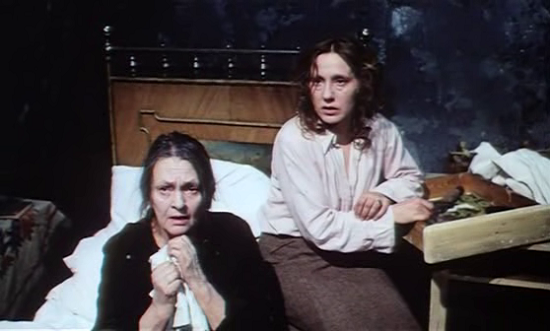 The performance of Maya Komarowskaya as the Polish widow is very powerful, intense, subtle, and shining. This is the work of a brilliant film maker who sees no reason to flaunt his brilliance - who submerges it in the story's texture, makes it breathe and pulse with life. In summary, the film transcends its status as a sombre, sensitive love story, and becomes a moving meditation on the dignity and indomitability of the human spirit when beset by pain, cruelty, despair and death. Deeply human, with acute observation, wry humor, and a startling finale, it is as powerful and uplifting as Zanussi's earlier The Contract.